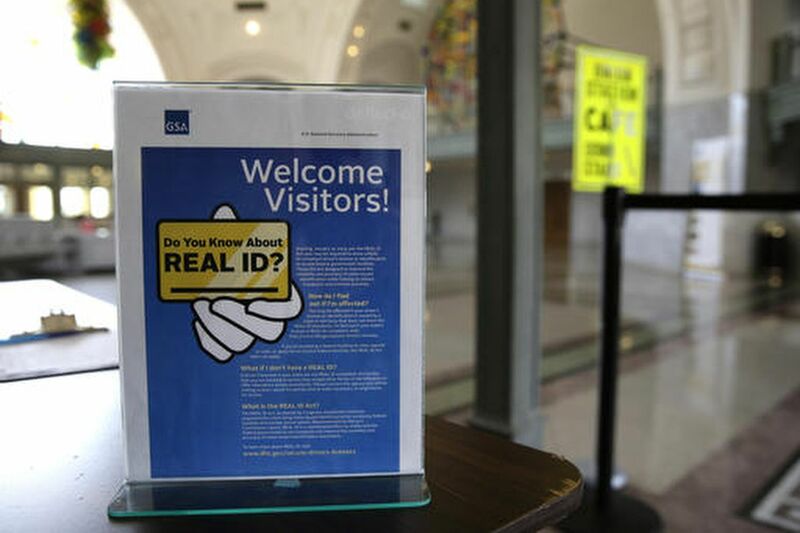 In this April 6, 2016, file photo, a sign at the federal courthouse in Tacoma, Wash., is shown to inform visitors of the federal REAL ID act, which requires state driver's licenses and ID cards to have security enhancements and be issued to people who can prove they are legally in the United States. Pennsylvania residents planning to use their driver’s licenses or other state IDs to board domestic flights and enter secure federal buildings next year can now get federally mandated REAL IDs, which PennDot began offering Friday. Residents need the IDs — or other forms of federally acceptable identification, such as passports and military IDs — starting Oct. 1, 2020. All states must offer identification cards that comply with uniform security standards in the federal REAL ID Act, which Congress passed in 2005 at the recommendation of the 9/11 Commission. The standards include security features, uniform descriptive information, and machine-readable technology. What is a REAL ID? Pa., N.J. prepare to follow federal security requirements. Pennsylvania and New Jersey are two of the dozen states granted extensions to comply with federal law. New Jersey has pushed back its rollout of REAL ID-compliant cards until the fall. The rest of the states are in compliance with the law. Twelve PennDot centers throughout the state — including 2904 S. 70th St. in Philadelphia; 143 S. Gulph Rd., King of Prussia; and ​1700 Markley St., Norristown — offer same-day REAL IDs. More than 140,000 Pennsylvanians — about 1.5 percent of PennDot’s customers — pre-verified for REAL IDs before they became available, meaning PennDot has already authenticated the identifying documents they need to qualify. These residents now can order their REAL ID-compliant cards and receive them in the mail in about 10 business days without having to go to a PennDot office. The cards will cost $60.50 — a one-time $30 fee, plus the $30.50 fee PennDot charges for ID renewals. The New Jersey Motor Vehicle Commission is focusing on reducing lines at offices and making current services more efficient by moving many of them online and retraining employees, said Brenda S. “Sue” Fulton, the commission’s chief administrator. The commission will be updating its website and is considering hiring more employees.